Bevel gears are cone shaped gears which transmit motion between two intersecting shafts. Zerol bevel gears (trade marked by the Gleason Co.) are spiral bevel gears in which the spiral angle is zero at the middle of the face width. They have the combination of advantages of straight and spiral bevel gears. Their characteristics are summarized below. The force on the teeth of zerol bevel gears are the same as straight bevel gears, eliminating the inward thrusting force. Because of this, they can be substituted with straight bevel gears without changing the attachment conditions or bearings. Since zerol bevel gears can be ground, compared to straight bevel gears, they are more accurate, quiet and have a superior anti-friction quality. 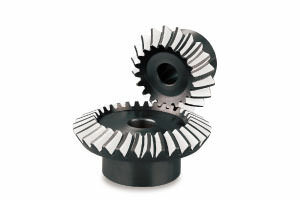 As with spiral bevel gears, they are used with right-hand and left-hand twist as a set. Normally, spiral bevel gears can be rotated only in one direction, but due to the zero twist angle of zerol gears, they can be rotated in both directions just as with straight bevel gears. Overall zerol bevel gears are stronger against breakage compared to straight and spiral bevel gears for the following reasons. The tooth length of zerol bevel gears is longer than those of straight bevel gears.